Japanese celebrate Valentine’s Day with insect sweets - Integration Through Media ....! TOKYO, (REUTERS): Tired of the usual box of chocolates? Try a bug cocktail or a caramel creepy crawly for Valentine’s Day. 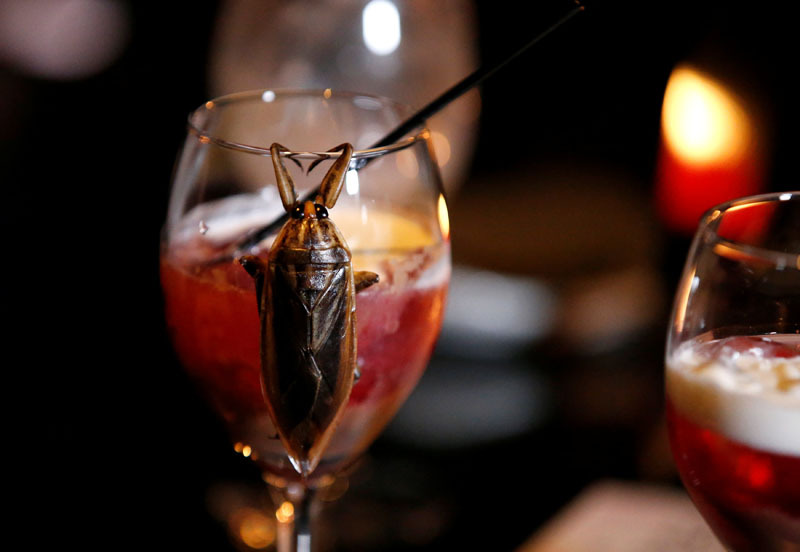 A Tokyo bar on Sunday offered courageous couples and curious gourmets a special menu of desserts and drinks made with insects ahead of Tuesday‘s holiday. “They are crispy like the skin of walnuts and go pretty well with chocolate,” Sayumi Makino (20) told Reuters Television at the Duranbar in central Tokyo. The menu ranged from a cranberry and water bug cocktail to caramelized worms with almonds and cashews. The whipped cream on some desserts included the internal fluids of giant Thai water bugs, known for their sweet taste. While insects can be found in some regional cuisines, bugs are not a common menu item across Japan. Yuta Shinohara, a university student who organised the bug cocktail night, said he wanted to promote an alternative food culture. “I love insects and I think it’s really fun to eat them,” he said, adding they were a sustainable food source too. Insects can be a rich source of fat, protein, vitamins, fibre and minerals, according to the UN Food and Agriculture Organization (FAO). The composition of unsaturated omega-3 and six fatty acids in mealworms is comparable to that in fish and higher than in beef and pork, it says. Globally, at least 2 billion people eat insects and more than 1,900 species have been used for food, according to the FAO, which said entomophagy could play a key role in food security and environmental protection.